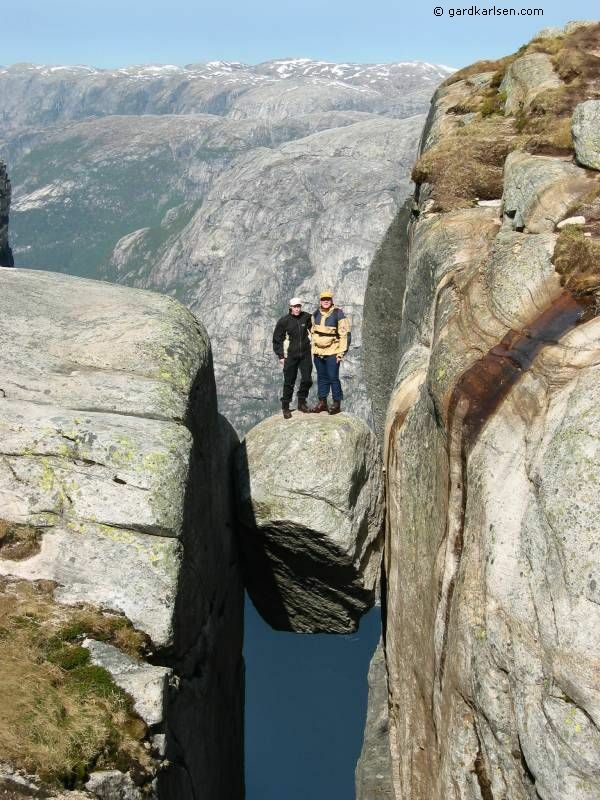 Kjerag has become a quite popular hiking destination in the last few years. 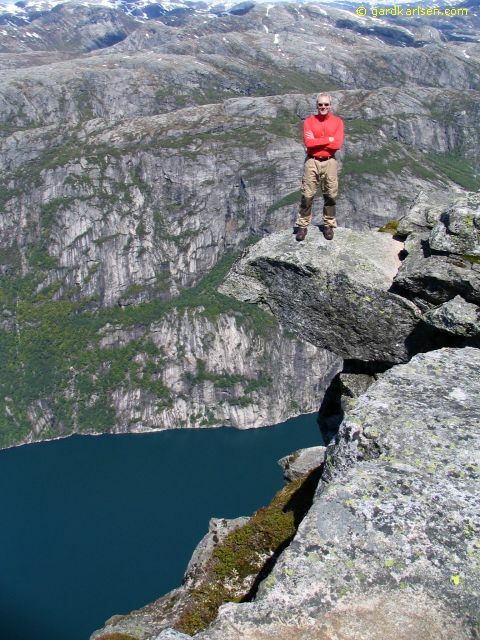 Some go there because Preikestolen has become too crowded, some people go to jump onto Kjeragbolten and quite a lot of BASE jumpers go there to dive of the mighty cliffs (video taken in July 2005, about 2 MB). 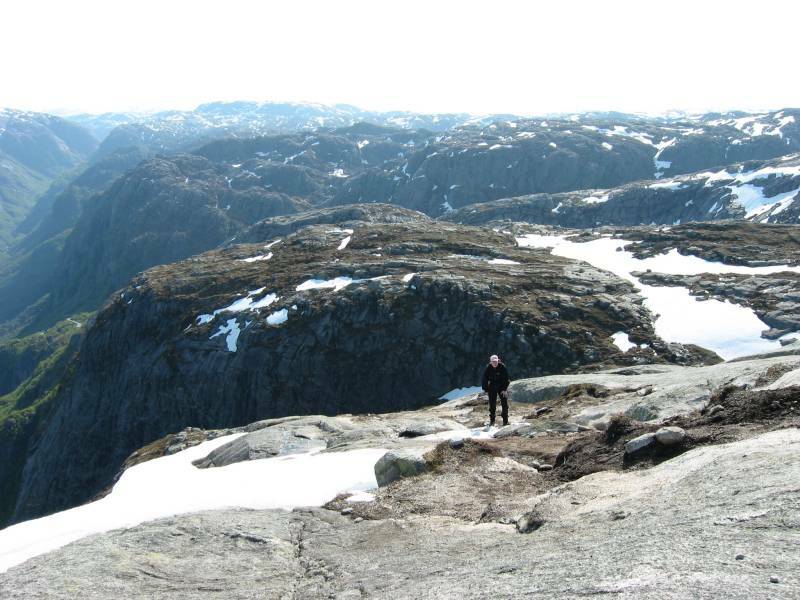 In this trip report you will find a bit of information about my trip to Kjerag on the 1st of June 2003. 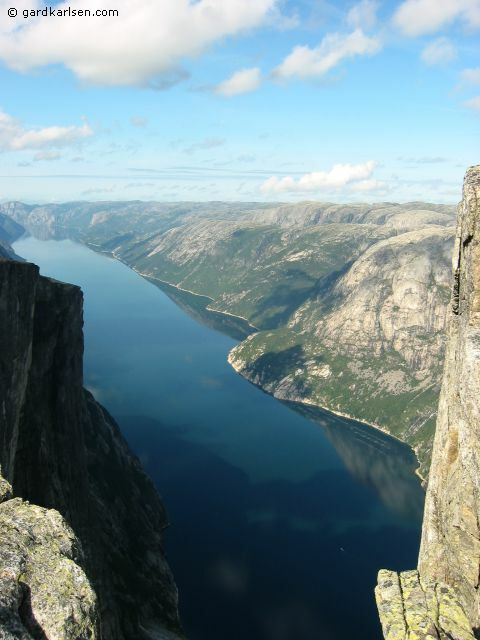 So how do you get to Kjerag? It is quite a long way to drive so it is best to start early. Take route E39 out of Stavanger and drive to Ålgård. Right after Ålgård you turn left to go on route 45 to Sirdalen. On the way you drive through Oltedal, Dirdal and Byrkjedal. On the way you will pass a new toll station at Øvstabø but I think that this is free for tourists (there is no manual way to pay the toll fee at least). 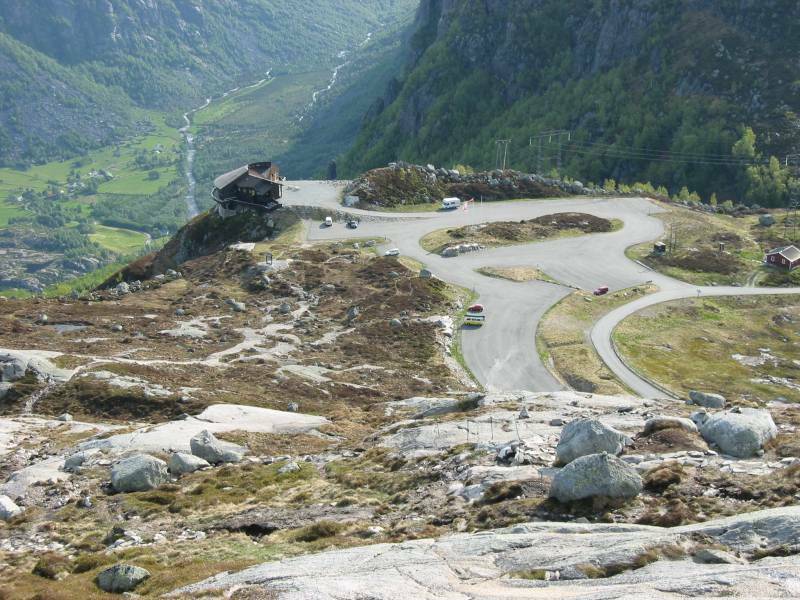 Turn left at Sinnes, and go past Fidjeland and then turn left again towards Lysebotn. It is a pretty nice drive because it is quite scenic. The road leading from route 45 to Lysebotn is also quite "fun". This narrow road was built in connection with the power plants that are built in this area and it reaches a maximum height of 932 meters above sea level. At this altitude there is a lot of snow in the winter and the road is normally opened in May and close for the winter in October. 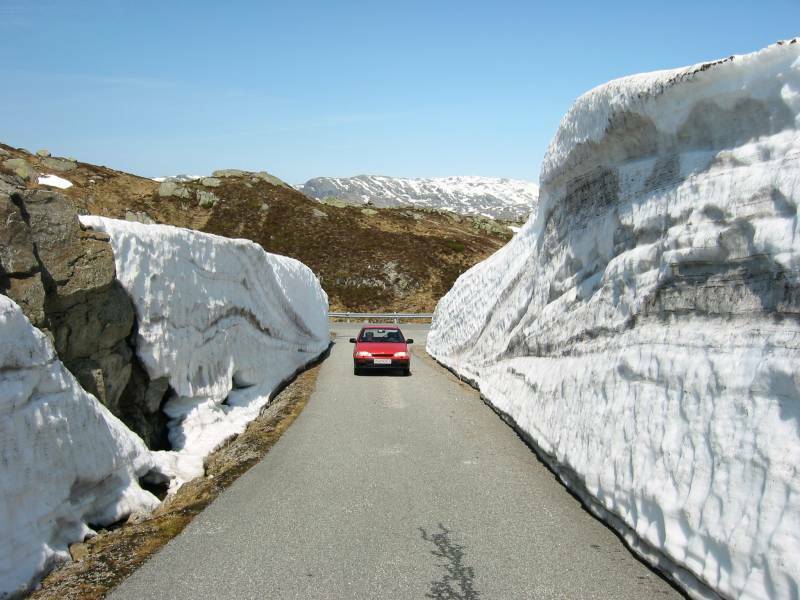 But even in June you can experience snow along the road. 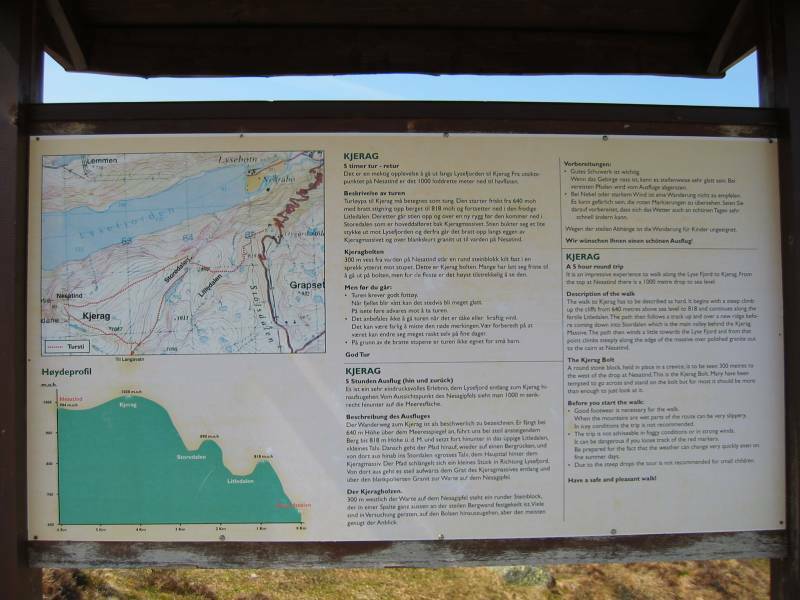 If you want to drive it is about 130 km from Stavanger so it takes about 1 hour 45 minutes to 2 hours to drive there. The other way to get there is to take a boat from Stavanger to Lysebotn. From the middle of June to the middle of August you can catch the ferry daily at 10 am (more information on can be found on Stavanger region). You can also do a combination: in July 2005 we drove to Kjerag and we took the boat home from Lysebotn at about 15.30 in the afternoon. We took the small ferry Fjordlys but this is so small that you have to call in advance to book if you want to take the car with you :-) In the summer you can get to Kjerag as there is a bus service - Google it and you will find the details. 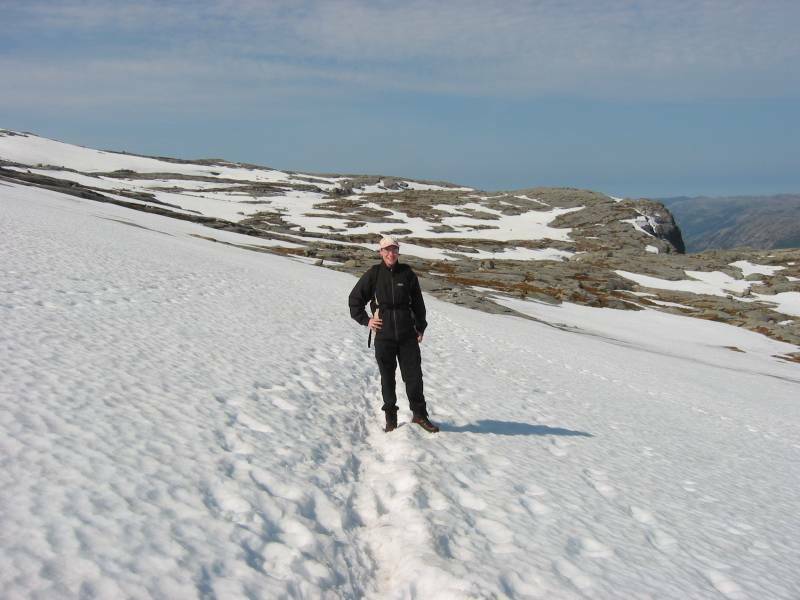 But outside the main season it has been tricky for people to make it here but now there is a tour company called Outdoorlife Norway that offers tours outside the main season - that is excellent! I have been to Kjerag a number of times before and this time I went with my brother Jone. We started from Stavanger at 6.30 am on this Sunday morning and after 1 hour and 45 minutes we reached the parking at Øygardsstøl located at about 600 meters above Lysefjord. Øygardsstøl has also got the nickname Eagle's nest because it seems to be on the edge of Lysefjord. Here you can buy something to drink and eat but I would recommend that you do this when you come back after the walk to Kjerag :-) The parking costs 60 kroner by the way. After about 2 hours we reached Kjerag. And when I walked to the edge I remembered why this is such an amazing place. 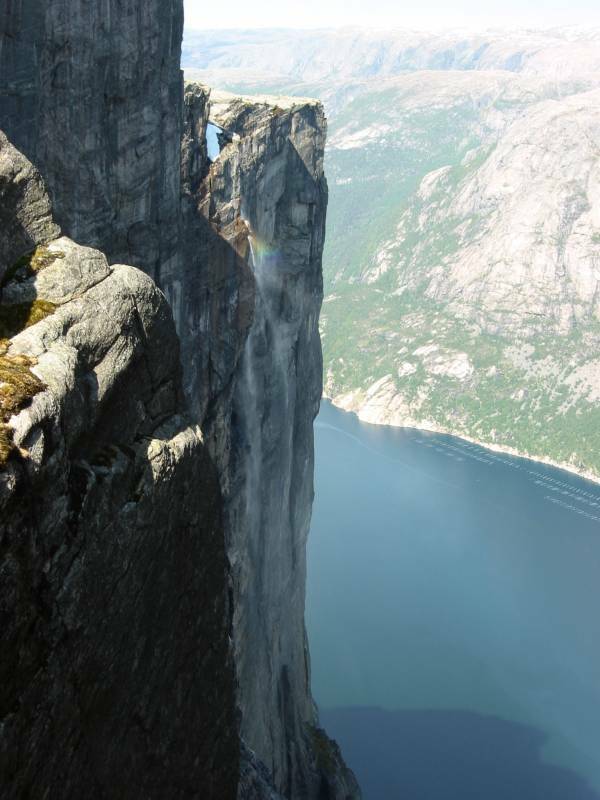 When you reach Kjerag and stand on the edge (if you dare) you can look down at the Lysefjord about 1000 meters (about 3000 feet) below. I’m not sure that I can describe how amazing it really is and I don’t think that any of the pictures that I have taken really shows how impressive this place really is. You just have to go there and see for yourselves :-) As I mentioned earlier this place has become quite popular for BASE jumpers (this is a 2MB video) and you are likely to see many if you go there in the main season. It is quite scary to watch them as they jump of the mountain. There have been some accidents here in the last years but it is still legal to do skydive from the mountain. 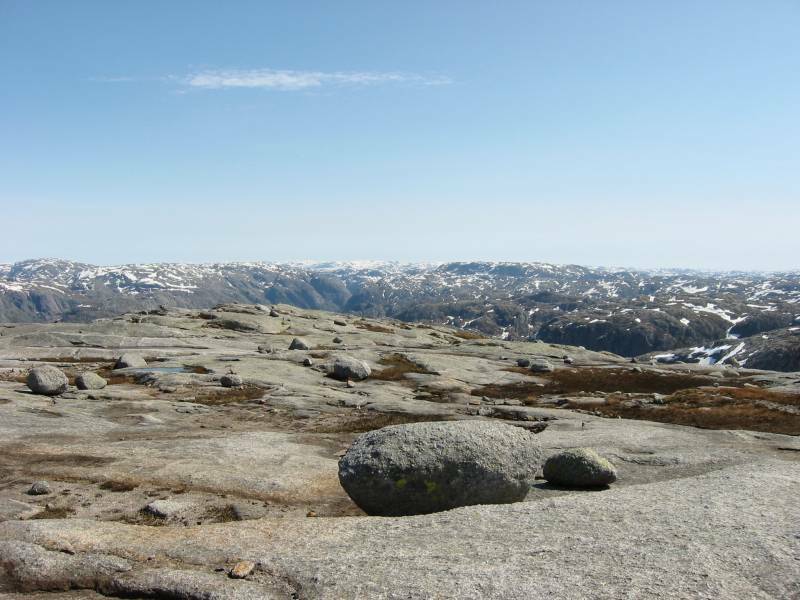 After we had enjoyed the view at Kjerag we walked the few hundred meters to reach Kjeragbolten. In my opinion this is one of nature's wonders and it is certainly one of the most amazing natural motifs that I have come across. 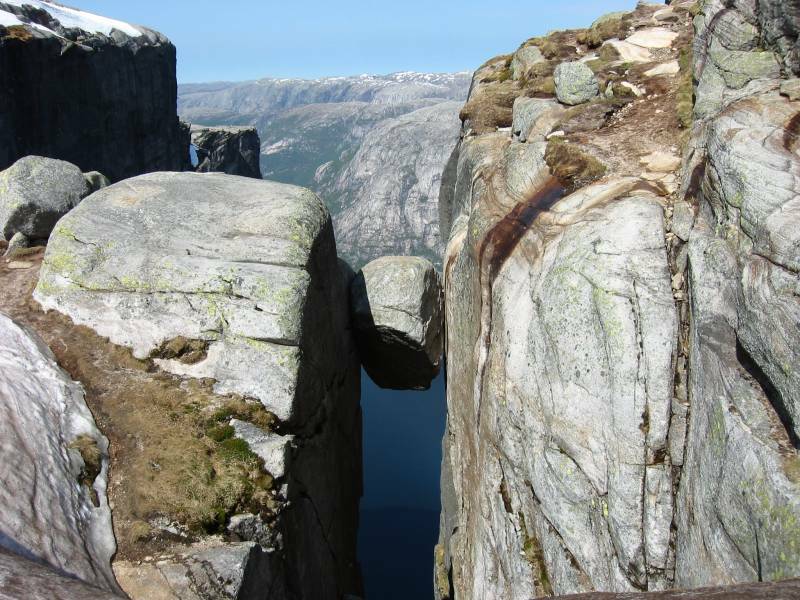 Kjeragbolten is a big rock that has fallen into a crack in the mountain and there it has been wedged into the crack. And it is possible to make your way out on the rock and from a certain angle it looks amazing. When we got there we met two German girls and we got them to take a picture of both of us on Kjeragbolten. 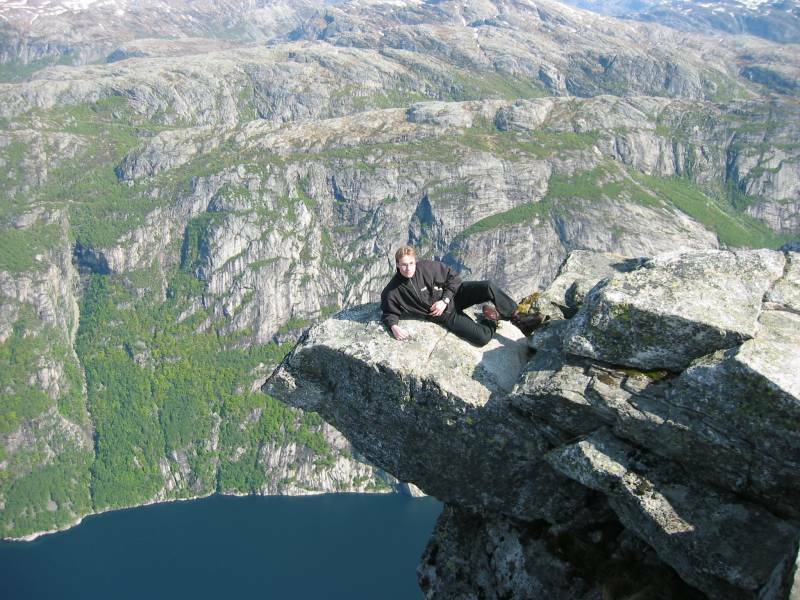 Yes, the rock is really located about 1000 meter above the fjord so the knees have a tendency of being a bit weak when you walk on to the rock. After the 2 hour walk it was nice to just sit down and relax with a couple of slices of bread with the traditional brown cheese (brunost is cheese made out of goat milk and it is great with honey on top…trust me :-). There were only 2 other people there while we were there. The other times that I have been there it has been very crowded and you must almost get in line to get onto Kjeragbolten. After relaxing for a while it was time to head back. As the day progressed it got warmer and warmer and we could start taking some of our clothes of. On the way back we met lots of people on their way up. The trip back is a pretty exhausting as well. Sure, you are going down but there are still some climbs and it is quite exhausting using your muscles to hold back. When we got back to the parking lot we checked our watches and we had used 5 hours to complete the trip. Do you need driving instructions? Please try to download this KMZ file. This can be displayed in Google Earth.